A low power or stereo microscope typically employs objective lenses of 50x or less. It is used to view specimens that are visible to the naked eye such as insects, crystals, circuit boards and coins. Stand that supports the microscope and houses any integrated illumination. Stereo microscopes are increasingly modular. This means that the same head can be used in conjunction with different focus blocks and stands. For example, Microscope.com offers a range of pole stands, track stands and boom stands. Take time to familiarize yourself with the parts of a stereo microscope contained in the image below. As in a compound microscope, there are two optical systems in a compound microscope: Eyepiece Lenses and Objective Lenses. Eyepieces or Oculars are what you look through at the top of the microscope. Typically, standard eyepieces have a magnifying power of 10x. Optional eyepieces of varying powers are available, typically from 5x-30x. Eyepiece tube holds the eyepieces in place above the objective lens. Diopter adjustment ring that allows for the possible inconsistencies of our eyesight in one or both eyes. Binocular microscopes also swivel (Interpupillary Adjustment) to allow for different distances between the eyes of different individuals. Objective Lenses are the primary optical lenses on a microscope. 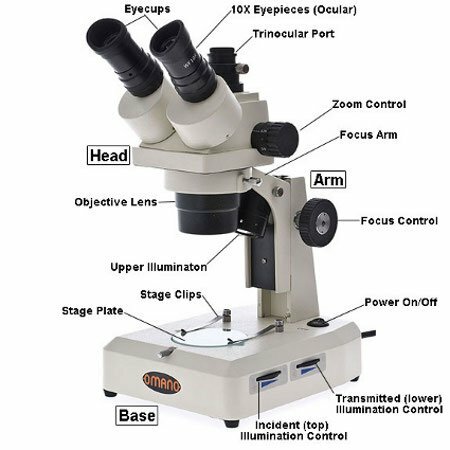 In a low power microscope, they provide fixed magnification or zoom magnification. Zoom magnification is typically offered in a Greenough design or with a Common Main Objective. Focus Control Most stereo microscopes have only coarse focus controls. Working Stage is where the specimen to be viewed is placed. Pole and track stands have simple stages since lower magnification powers require less subtle movements than high power microscopes. Stage Clips are used when there is no mechanical stage. Transmitted Illumination Since most specimens examined on a stereo microscope are opaque, a top light (Transmitted Illumination) is used to shed light on the specimen. Some stereo microscopes also include a bottom light (Incident Illumination).